​ ​MIDLAND – Occidental Petroleum and Chevron’s Midland campuses soon will be getting a new neighbor as Anadarko Petroleum moves forward with its plans for a new regional headquarters. ​Groundbreaking is expected before the end of 2017 and construction is expected to take 18 months. 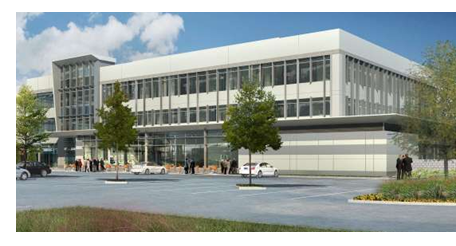 The regional headquarters will be comprised of two buildings totaling 350,000 sf and an amenities building totaling another 100,000 sf. In 2012 Anadarko reviewed the numerous logs it had from its work in the Haley ​and “realized the Wolfcamp was something we might have overlooked. The Wolfcamp today is the most exciting onshore formation in the world,” said Al Walker, Anadarko’s president and chief operator​.